Donald Trump has been officially confirmed as the 45th President of the US after a joint session of Congress certified the votes of the Electoral College, sweeping away a myriad of attempts to contest the validity of his election triumph. In a last ditch effort to invalidate Trump’s victory, 10 US representatives objected to the House’s certification, but failed to convince any senators to join them. As a result, the Electoral College results were confirmed. Citing voter suppression, stifled recount efforts, and Russian meddling, House Democrats attempted to challenge Trump’s victory on Friday. 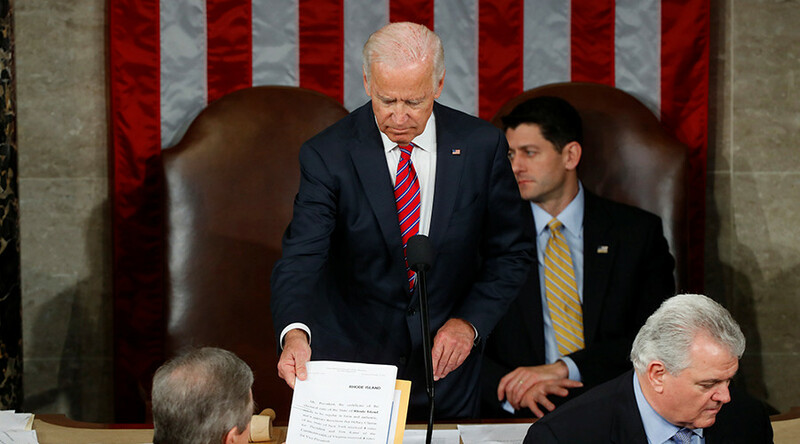 The effort was short-lived and unsuccessful, prompting Vice President Joe Biden to declare, “It is over” after a House member’s failed objection. California Democrats Rep. Barbara Lee and Rep. Maxine Waters, along with Rep. James McGovern of Massachusetts and Rep. Sheila Jackson Lee of Texas challenged the electoral vote certification on Friday. Jackson Lee raised objections to multiple state vote counts, including in Wisconsin where recounts maintained Trump’s lead over Hillary. Jackson Lee attempted to submit a written objection over the issue of votes in Mississippi where she said “ballots that were provisional that denied individuals access.” But the representatives’ failure to secure a US senator to co-sign resulted in Biden dismissing the issue. Jackson Lee attempted to raise issues of Russian interference, but had her microphone unceremoniously cut off. There was widespread voter disenfranchisement this election cycle, especially in the swing states of MI, WI & NC, targeting people of color. She also raised concerns over the Russia issue, saying in Congress that the validity of the results could be questioned "because people are horrified by the overwhelming evidence of Russian interference in our election." “I don't care that it is not signed by a senator,” Waters said 16 years ago. On Friday, it was a case of deja vu. Her plea, “is there one United States senator will join me in this letter of protest?” was met with boos and Speaker Paul Ryan (R-Wisconsin) was seen cackling behind Biden. Most Democratic senators did not attend the vote and the few who were present did not offer to sign her letter. Outside, protesters also tried but failed. Shouting slogans such as, “the commander in chief is a threat to American democracy” while others raised objection to voter suppression. The protesters were later removed and charged with disrupting Congress and "Each person was given a $50 fine” according to Jason Charter, an organizer with Unite for America.